Searching for a last minute Valentine’s Day dessert recipe? Look no further. 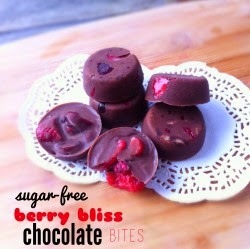 Love is in the air with Carrington Farms Berry Bliss Chocolate Bites! Created by leading organic health food company, Carrington Farms, this simple, no bake dessert is a sweet treat that will make any chocolate lovers mouth water. And, the best part is, this decadent treat gets its sweetness from real fruit, making it a healthier for you splurge. 1. Mix the melted coconut oil with cacao powder and stevia. 2. Chop the frozen berries into smaller pieces and distribute among 9 baking cups. 3. pour 1 tbsp chocolate mix into each cup over the frozen berries. Place in freezer until set, 5-8 minutes and enjoy!